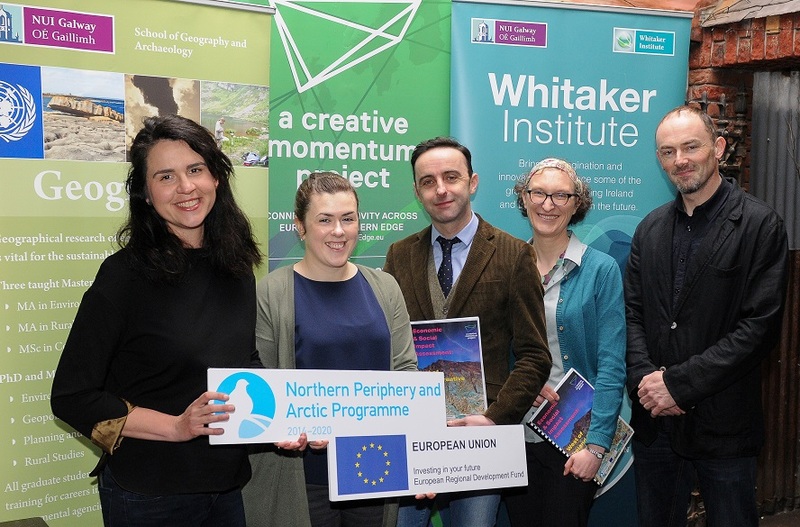 Funded through the EU Northern Periphery & Arctic (NPA) Programme co-funded ‘a creative momentum project’, the research was conducted by Dr Patrick Collins, Dr Aisling Murtagh and Dr Ben Breen of NUIG’s Whitaker Institute and Discipline of Geography. The WDC is lead partner for this transnational project. As the report states, assessing the value of the creative sector (defined in the report as Advertising, Animation, Architecture, Craft, Cultural Facilities, Design, Film, Games, IT and Computer Services, Marketing, Music, Performing Arts, Photography, Publishing, Radio, Software, TV and Visual Arts) is a complex task. Combining existing knowledge and official statistics, with survey data (152 respondents made some reply to the online survey) and in-depth interviews with nine creative sector entrepreneurs from the region, the impact assessment presents key economic estimates but also goes beyond traditional economic measures to encompass a wider socio-economic focus. Total direct sales of the creative sector in the Western Region amounted to €486.2 million in 2016. Making use of a multiplier, the researchers derived a total value of the sector to the Western Region of €729.2 million. Average company sales differ across sub-sectors. The sub-sector which the researchers designate as ‘creative industries’ (Media/Advertising, Architecture/Design, R&D, Professional Services, Software & App Development) reports average sales close to twice that of enterprises in the ‘craft industries’ (Traditional Craft, Print & Recorded Media Production, Electronic Manufacturing, Other Manufacturing) and ‘cultural industries’ (Performing Arts & Education, Publishing, Film & TV). 46% of survey respondents derived some portion of their sales from exports. Across the sector this accounted for 18% of direct sales or €87.4 million. Smaller and younger companies were least likely to export their produce. The sub-sector which the researchers designate as ‘creative industries’ is the youngest sub-sector with more than half of operations surveyed less than five years old and close to 10% had been in existence for less than one year. The analysis found that the overall creative sector in the Western Region consists of a large number of small and micro enterprises with an average of 2.6 employees per firm. Official statistics from the CSO indicate that a total of 12,871 people were employed in the sector in the Western Region in 2015. The largest sub-sector was ‘creative industries’ (57.3%, 7,380) followed by ‘cultural industries’ (30%, 3,847) and ‘craft industries’ (12.7%, 1,644). Geographically, employment was concentrated in counties Galway (22%), and Donegal (18%). The results of the survey suggest that employment in the overall creative sector grew in recent years. Employment in ‘cultural industries’ increased by 2.3% (2012-2015) while in ‘creative industries’ there was stronger growth of 15.8%. ‘Craft industries’ however showed no significant change. Infographic of the Economic Impacts of the creative sector in the West of Ireland. The creative sector is locally embedded, facilitating strong local economy value capture. But it is also internationally and globally focused, supporting economic growth. The creative sector can contribute to re-inventing perceptions of peripheral regions as attractive, creative places to live, work and visit. The qualities of creative sector entrepreneurs are an asset that facilitate harnessing of local opportunities, such as from place-based resources including culture, traditions, landscape and heritage. Inter-sectoral mobility of creative labour, as well as strong knowledge transfer to emerging talent and other entrepreneurs, strengthens the human resource capacity of the region. The open and collaborative approach of creative sector entrepreneurs builds a supportive entrepreneurial environment aligned with the concept of ‘coopetition’. Creative sector entrepreneurs also contribute to positive social and community impacts. The analysis suggests the creative sector has significant economic and social value in the Western Region of Ireland. It highlights the important role of the creative sector in supporting more balanced, sustainable development in peripheral and rural regions. The sector’s structure, composed of small locally engaged businesses, is an important part of its value. Placing the creative sector as part of a regional development strategy can support a move away from reliance on service and primary sectors and towards a more diversified economy focusing on new sources of economic competitiveness. Synergies between the creative sector and other indigenous industry sectors, such as agriculture, the marine and tourism, provide avenues for exploration to support future sustainable growth. The researchers conclude by noting that this is a one off report based on limited evidence. Better evidence can help to identify benefits of particular creative sub-sectors so local agencies can focus on sectors which best address specific local development needs. To more fully capture the value and needs of the creative sector regularly published official statistics measuring key socio-economic indicators by region and creative sector are needed.